That will help you identify a lot of crawl errors and issues. If you work with a professional SEO, chances are they're going to use a tool like OnPage.org or Screaming Frog or . Those are all good too. They can provide a little bit more extra detail. You could do this in Excel. You could do it in a Google Spreadsheet. You could do it in . I want you to use a bunch of different sources. I want you to look at keywords that your competitors are ranking for. You can find that from lots of different tools. You could use something like Keyword Explorer. 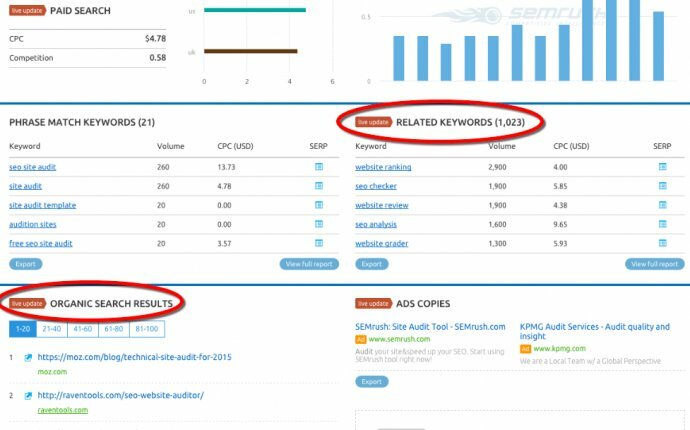 You could use SEMrush. You could use KeyCompete. You could use SpyFu. There are lots and lots of tools that allow you to do this.I want you to also use the related and suggested search terms that come up when you search for the key terms and phrases you're already targeting in Google. I want you to use semantically-connected terms and terms that are in the format of questions. A lot of folks like Answer The Public. Moz also has the filter in Keyword Explorer for queries that are in the form of questions. These will give you a big, big, broad list.